Simpo A-frame signs are set up in front of store entrances or along sidewalks to get the attention of potential customers and drive foot traffic into stores. 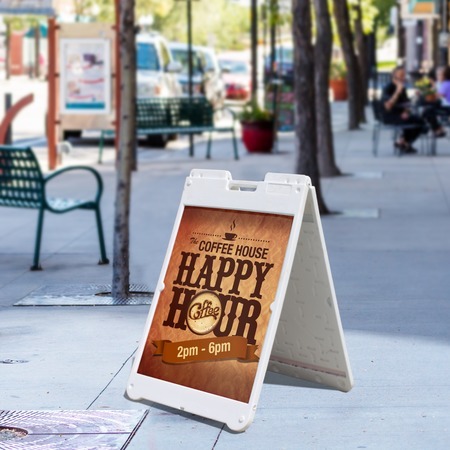 This type of A-frame signs are used to advertise sales, promotions or specials. They are lightweight and portable, making them easy to bring in at the end of every business day. The signs that fit into the plastic simpo A-frames are printed on weather-resistant 3/16" corrugated plastic board. The graphic space is 22" x 26". One sign goes into each the front and back slots of the frame so that your advertisement can be viewed from both sides. Printing time is 2-3 business days, excluding shipping time. Order in quantities anywhere from 1 to 10.